Origin and Habitat: Australia, Central Queensland, (Carnarvon Range and the Emerald, Taroom, Springsure and Rolleston districts). Altitude: Occurs from 300 to 500 m asl. Habitat: Plants grow on low hills in dry sclerophyll forest at the edge of rainforest, in woodland and also in the valleys and escarpments of rocky gorges on shallow rocky soils. The species grows scattered in large colonies, but rarely forming a well-defined layer, frequently in very scenic rocky areas. The ground cover is dense and dominated by the grasses Themeda australis and Imperata cylindrica var. major, but forbs are predominant. Annual rainfall 500 mm, with a summer maximum. Summer climate diurnal range 21-35°C, winter 6-23°C; severe frosts common. Plants have been affected by loss of habitat which has led to many plants being destroyed. Some have been removed as part of salvage operations. 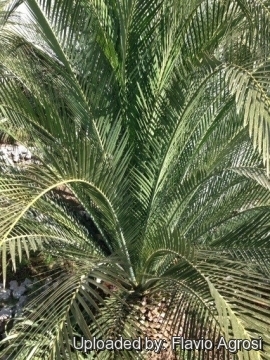 Description: Macrozamia moorei is the tallest-growing species of Macrozamia. Many Macrozamia species do not have above ground trunks but this is not the case in Macrozamia moorei which has an extremely stout caudex. It is very similar to the somewhat more common Macrozamia johnsonii, but can be distinguished by the keeled leaves and slightly more blue-green colour of the leaves. Crown: Large rounded, date palm-like with many dark blue-green moderately crowded fronds sometime exceeding one hundred, perfectly arranged and gracefully curved. Trunk (caudex): Massive, columnar, mostly 2-5 m high but up to 7(-9) metres tall and 30–80 cm in diameter and with leaf-bases defined by persistent remnants. Leaves (fronds): Up-curving to gracefully arching in profile, pinnate, 1,5-2,5(-3) m long by 30-60 cm, at first bright green becoming dark blue-green as they mature. Petiole 2-10 cm long, swollen and woolly at the base bearing numerous spines at least 10 cm from point of attachment. Rachis not twisted, yellowish, concave above, keeled beneath. Pinnae (leaflets) 120-220 evenly distributed throughout, narrow, linear-lanceolate, pungent-tipped, sharp, 20-35 cm long and 5–10 mm broad arranged in a V-shape along the midrib at about 40° and contracted to a white, callous base. The lower leaflets degenerate into spines along the short petioles. Cones: Male and female cones are on separate plants. The seed cones are, green, barrel-shaped one to eight on each plant and about 40 cm to 90 cm long and 15 mm to 20 mm in diameter with an apical spine up to 7 cm long; peduncle 15-25 cm by 3-4 cm, stout. The male cones are up to 100 on a large plant, green to brownish, spindle-shaped, straight or more usually curved, 30–45 cm long, 8–10 cm in diameter with an apical spine 2–25 mm long; peduncle 10-15 cm by 2-3 cm. Plants starts to produce cones in about 50 years. Seeds: Ovoid and about 4 cm to 6 cm long and 2,5 cm to 4 cm wide. The sarcotesta (fleshy seedcoat) is red to scarlet when ripe. Remarks: Plants have grown to 2 m tall from seed in less than 100 years. Since plants 8 m tall are known, extrapolation would suggest that ages may exceed 400 years. 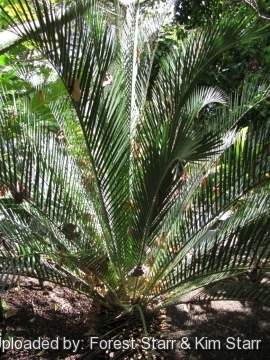 Notes: Primeval cycads like this Macrozamia moorei are some of the oldest plants still living on the planet that trace their origins back to the ancient flora of the early Mesozoic era more than 170 million years ago. The particular point of interest, at least botanically, about Macrozamia moorei is that it represents the nearest approach to the Bennettiales, a group of fossil, cycad- like plants existing in the mesozoic era. 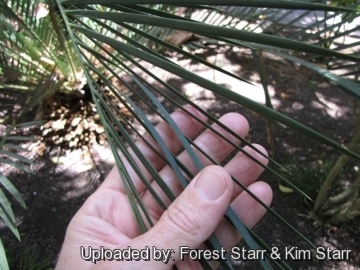 1) Forest & Kim Starr Macrozamia moorei (Cycad). Plants of Hawaii. <http://www.starrenvironmental.com>. Downloaded on 22 September 2014. 8) Forster, P. 2010. Macrozamia moorei. The IUCN Red List of Threatened Species. Version 2014.2. <www.iucnredlist.org>. Downloaded on 22 September 2014. 9) Wikipedia contributors. 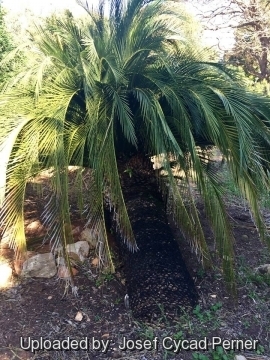 "Macrozamia moorei." Wikipedia, The Free Encyclopedia. Wikipedia, The Free Encyclopedia, 15 Mar. 2013. Web. 22 Sep. 2014. 11) Ken Hill: Macrozamia moorei – In The Cycad Pages. 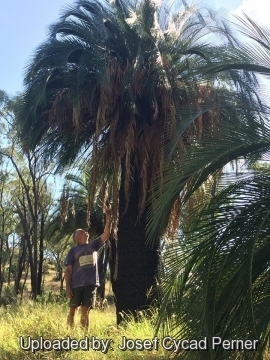 <http://plantnet.rbgsyd.nsw.gov.au/PlantNet/cycad/> Downloaded on 10 August 2014. Cultivation and Propagation: Macrozamia moorei is easy to grow but a relatively slow plant until if finally forms a stem, and then it puts out a new leaf nearly continuously. Because of its ruggedness, low maintenance and drought tolerance it is grown in tropical, subtropical and temperature regions. It is a hardy and versatile species and adapts well to climates and soil with good drainage. This plant may be cultivated as an indoor plant in temperate countries. Soil: Needs a well drained sandy or sandy loam spot, with deep soil, neutral or basic (tolerate limestone) but will still thrive in less than ideal conditions. Mulch with organic materials (bark or leaf mould). Hardiness: Macrozamia moorei is suited to tropical, sub-tropical, and temperate regions and tolerate occasional heavy frosts, but it should be protected from extreme and prolonged cold. Pest & disease: It is prone to mealy bug infestation, though it rarely really hurts the plant much. Use: It makes a great accent or specimen plant. Several can be planted together for a lush, tropical effect. 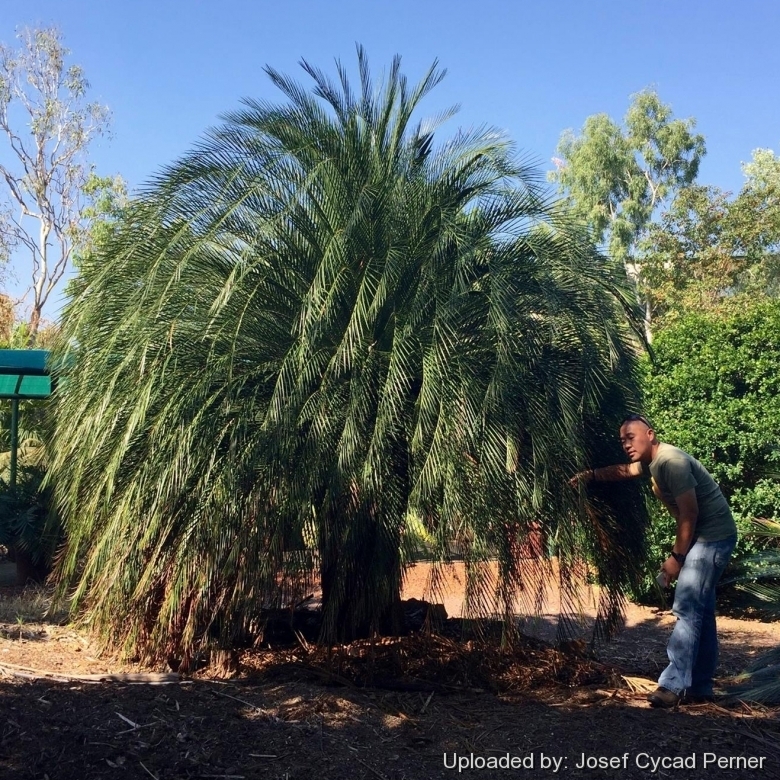 Plant on three to five-foot-centers to create a mass planting. Mature specimens transplant readily. Use near the patio, in mixed foundation plantings or in perennial beds. It take well to cultivation in the container and is a spectacular house-plant or interior-scape specimen in cool areas tough enough to survive occasional neglect and harsh indoor environments. Warning: This plant is poisonous and contain a poison which causes paralysis. Poisonous Parts: Fleshy seeds, stems, roots, leaves. Protect pets and instruct children to never eat or chew any plant material without permission. Edibility: Seeds are extremely poisonous. However, Aboriginals made flour from the seeds after lengthy soaking in water to remove the toxins. Processed flour, toxic if large quantities eaten.